Aside from a catchy name, stylish packaging and a lush curated Insta, So Shape has actually something pretty cool going on. These days, with focus shifting more towards being fit and healthy rather than weight loss itself, So Shape are setting the rules differently for dieting. So Shape is a ‘smart meal’ business that offers different kinds of healthy, low calorie meals and snacks that still taste delicious. And sure, sure, we know all diet plans claim the same, but this one’s catching some attention. I mean first, one can’t deny the eye-catching aesthetic of their uniformed Instagram; bright summery hues of blues, reds, yellows and greens stand out, giving So Shape a promising start. Having actually started using the So Shape shakers for ourselves, we really grew to enjoy this diet. The rules are simple: you replace two of your meals in the day with two smart meals, along with a healthy lunch that’s totally open for you to choose (maybe just no fast food, though… it’s not that open). This rule can be quite flexible for those who have their favourite go-to foods (for us, that would be cheese, hummus and crackers) and simply don’t want to give up on them for a super strict diet. Having one open meal a day meant the dieter could still enjoy their faves, within reason. The ‘smart meals’ can either be one of their many delicious shakes or a hot meal that comes in the form of soup, pasta, risotto and more. With the shake flavours covering all sorts, such as Mint Choc Chip, Raspberry, Caramel, Cookies ‘n’ Cream, we had a ball trialling them all. As we didn’t have any of the hot foods, we opted to substitute at least one of our meals per day with a shake. This happened to be breakfast as it was the most suiting meal to replace with a shake. For those who want to know about the ingredients of the smart meals, they comprise of a whole lot of nutrients and are high in protein and fibre, low in sugar, vegetarian and GMO-free. At first, the diet did take some getting used to. Being accustomed to three meals a day meant we’d have to shake things up a bit (pardon the pun), and a shake did not quite seem fulfilling enough for breakfast. However, a couple weeks into the shake-breakfast diet, there’s no denying we really came to love it! Not only were the flavours tasty, the shakers did fill us up and they truly grew on us over time. We mostly loved how easy the shakes were, particularly for our very on-the-go London lifestyle. If we didn’t have time in the morning to pull out a bowl and fill it with granola or flip some eggs on the frying pan (which let’s face it, was far more often than not), the shakers would be our saviours. We’d shake them over ice the night before and leave in the fridge to stay cool, ready to pick up and run out the door with early in the AM. They were the best quick meal to guzzle on our way to work, the gym or even an evening event we might be headed to. We did, however, try out So Shape’s granola as well and let us tell you it was totally delicious. It was served best with yoghurt, some chia seeds and other fibre-filled mixes sprinkled on top – we need more of this ASAP. 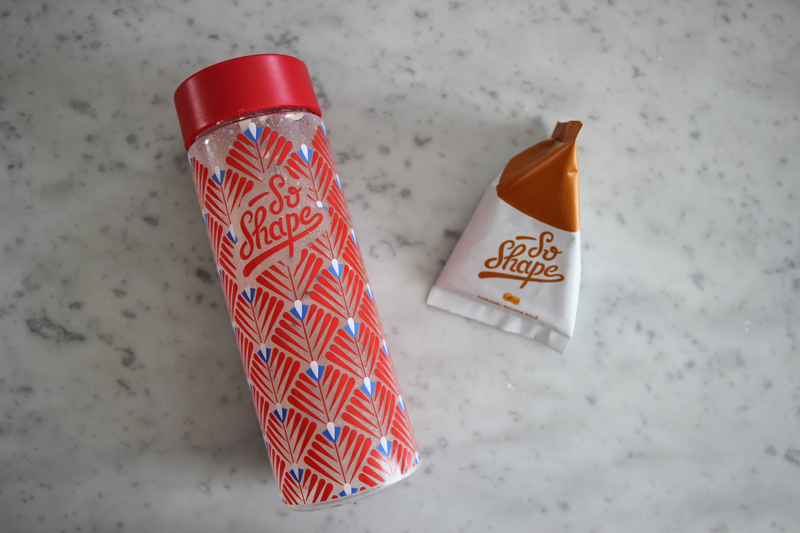 The stylish So Shape shaking water bottle looks cute, but we did have a little issue drinking through the small mouth hole. We recommend buying a protein shaker that has a larger mouthpiece, just so that the shaker can slide through with ease. The texture can be quite thick and chunky, especially if you’ve got one like Cookie’s and Cream. In addition to this, it is too hard to thoroughly clean as you cannot fit your hand in the water bottle to scrub the bottom. This would result in us having to aerate the bottle as it could get rather smelly. We’d love to try the diet out properly some time and actually start incorporating the hot meals as substitutes for our dinner or lunch. Seeing as we’re already hooked on the shakes, we have no doubt the hot meals would taste just as great! Find out more on the offical website here.